I had been approached by countless friends regarding network marketing companies. Some of them seemed great and I totally thought the products sounded wonderful but I never had a peace about joining any of them (and for many of them I was never willing to spend $500 + to join on top of some $100 + monthly autoship). I did not want to spend a ton of money to then try and make money. 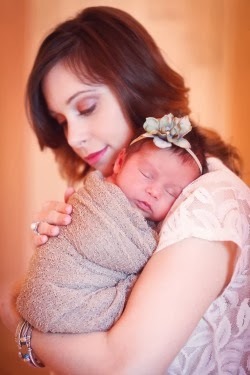 However I had been praying for months for the Lord to show me away to make some extra income while being home with my baby girls (who were 1 and 2 years old at the time). 1) Do you have to buy product every month? 2) Can you cancel quit at anytime for FREE? 3) Well... what do you have to lose? 4) Don't you spend $99 almost every time you go to Target? These were the types of pictures that caught my attention! Fast forward a week and the wraps came. I actually already had a few customers because when I showed my mom, sister, and 2 close friend the pictures from Ann's Instagram they all wanted to try these crazy things! So before my wraps even came I earned $120 FREE in product credit plus 2 boxes of wraps for only $25 each because I got 4 loyal customers which was kinda crazy!!!! Customers were coming to me! Now here is where this thing gets CRAZY! This company is known for their BONUSES now I am not talking about a pink car bonus, or even some certain type of car monthly payment bonus, or vacation bonus or anything like that... I am talking about hard, cold CASH BONUSES ranging from $10,000 - $100,000. Now I was a SKEPTIC even after joining I figured the one in a million really got any of these bonuses. Surely only the top dogs made the big bucks and the rest of us just got pennies but that is absolutely not the case. 3 Months after joining I promoted to Diamond Level and earned a $10,000 BONUS (on top of my now $2,000 a month commission). 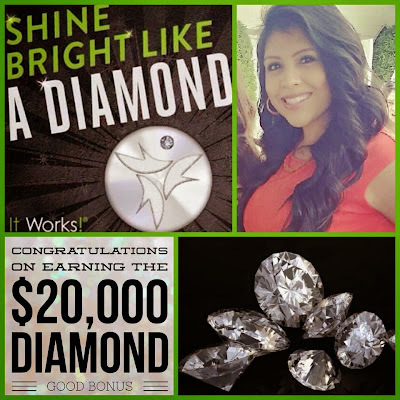 The next month I went Double Diamond and then 4 months later went Triple Diamond and earned a $50,000 Bonus! John decided to join me in this adventure and he went Diamond in 4 months and earned a $20,000 Bonus and the next month went Double Diamond and earned a $30,000 Bonus (The bonuses doubled the months he earned them). So together we have earned $110,000 in BONUSES alone! This may be hard to believe but it is the 100% TRUTH. My mom earned the $10,000 Diamond Bonus and keep your eyes open the end of this month to see what else she earns!!!! My Bestie Kathie earned the $10,000 Diamond Bonus and is incredibly close to her next Bonus!!! Melissa was friend of a friend and I am so thankful our paths crossed! This girl went Diamond faster than any of us and grabbed a $20,000 Bonus and is not stopping there!!! She just retired herself from her corporate job to do It Works full time! There are quite a few others who joined my team that will be claiming BIG BONUSES this month but I do not want to ruin the surprise so stay tuned for those announcements!!!! Now these bonuses are IN ADDITION to our monthly commission. If you want to know what we make here is the average income for each rank! I personally have always made WAYYY above the average but at least this gives you an idea of what an It Works Distributor earns each month. I sometimes hear people ask if this is a pyramid scheme so I do have to address that question. How can something that cost $99 and comes with a product that cost $99 be a scheme lol That question is almost stupid silly (sorry if you've asked that before) To be honest CORPORATE AMERICA is the pyramid scheme. My husband will never ever make what his boss makes or what his bosses boss makes unless of course he leaves that company and finds a new company with a larger salary. John may get a 3-6% raise a year if his performance is good but he will never double, triple, quadruple his salary from month to month (but guess what... I can!!! and I am doing it!!!) So what is the real scheme? > You go to www.jointeamalcala.com & "JOIN THE PARTY"
You pay $99 and that gets you a box of wraps, 4 mini defining gels and some other promotional material to get you started. > There is a $20 website fee that is OPTIONAL. You get it FREE your first month and then can decide if you want to use it or not. > It is optional to run your autoship each month although I always order 1 box of 4 wraps for $59 and 1 box of Greens On the Go for $35 each month! I then sell the 4 wraps for $25 each and my Greens on the Go were FREE!!! I love making extra wrap cash by selling wraps I have on hand!!! I have wanted to post this Blog for a while now but to be completely transparent my feelings got super hurt when someone close to me said "You need to be careful becasue all of your It Works posts seem super braggy and it seems like you are trying to show off" That broke my heart because that is the total OPPOSITE reason of why I post. I post about these bonuses, my success, my teams success becasue I want to show the WORLD there is a way to work from home if you want to! Sure it is WORK but it is easy work and in my opinion it beats being away from my girls working 40 hours a week (although everyone has different opinions and that's fine) I 100% truly believe that God brought this whole thing into my life for such a time as this and I want to share it with people who may need it. You do not know what struggles the person next to you may have...it could be they need a financial break through, or maybe that mama just needs some "me money" or maybe they can live on their spouses salary but it means saying no to a whole lot of things they don't want to have to give up or maybe they just want a way to make money to be able to bless more people! John and I got married as kids barely 22 years old and we know what it is like to be 2 young college students married, working multiple jobs, with college tuition to pay & NO EXTRA money. We also know what it is like to be blessed and not have financial struggles and we know what it is like to live off of one income (which was by the way easy breezy without kids lol) and then somethings had to give as the babies came along which added preschool tuition, extra curricular activities & the list goes on...But this past week we spent a week in California without having to budget a penny thanks to this crazy part-time/spare-time JOB! For me this business was a God-send and it 100% financially transformed our lives. We can not help but want to share it with EVERYONE in our life. If it sounds boastful please know that is not my heart, if it gets annoying I understand if you un-friend or un-follow me. But I just want to share with you what I have found... This was by far, hands down the best $99 I have ever spent in my entire life and I just know it could be a life changer for you too! And I've said it before but this past 10 months could be summed up in 3 words FRIENDSHIP, FUN & FREEDOM. I know I may be bias but there is a reason my TEAM is on fire!!! We truly have the most supportive, knowledgeable up-line! My team may be spread across the US but we are incredibly close, we are more than a TEAM we are a FAMILY. We do weekly trainings, conference calls and you are never alone! We truly coach each other along the way and you are given all the tools & resources you need to succeed. If you have at all been thinking about giving this crazy wrap business a try I would love chat!!!! Feel free to email me sheriswraps@yahoo.com or call/text (972)821-8931. I аm really glad tto glane at this weblo poѕts which consiѕts of tonjs of useful information, thаnks for proѵiding tһeѕe dаta. Either these small and local businesses either are not advertising at all,bitcoin baccarat or, when they do, they make considerable mistakes doing so..
Make sure not to price yourself out of the market, and figure out how to deliver the best value to your customers. list of recruitment agency in malaysia you can visit Randstad Recruitment Agency for more details. Regardless of whether you're a purchaser and you choose not to hold the administrations of a business broker or exchange guide, you'll get the advantages in light of the fact that a business broker is working with the vender.